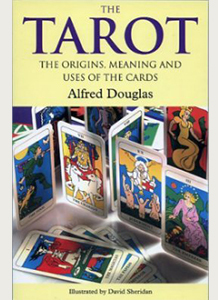 Here the authoritative Library Journal sums up the continuing appeal of The Tarot: the origins, meaning and uses of the cards by Alfred Douglas. This classic study of the Tarot examines all aspects of the subject – origins, history, symbolism, meanings of all 78 cards, techniques of divination – including details of how to play the ancient game of Tarocco. The mystery behind the original meaning and purpose of these cards is even now not fully understood, and the puzzle offered to us by their elaborate and beautiful images never completely resolved. But the Tarot, the author tells us, is more than a fortune-telling device or a card game. It is a profound guide to the journey of life, with parallels found in the ancient Mysteries, Gnostic religions, and the writings of C.G. Jung. This book was probably the first (1972) to discuss the parallels between the imagery of the tarot major arcana and Jung’s ‘process of individuation’ – the process of psychic development leading to increasing wholeness over the course of a human life. Alfred Douglas explains how each card can be interpreted at several levels and reveals how, as the mind explores the Tarot images, it can uncover meanings and significance. The Tarot speaks in the language of symbols, the language of the unconscious, and it can open doors into the hidden reaches of the soul, linking the world of humankind with the world of the spirit. Alfred Douglas’s illuminating text is superbly illustrated by David Sheridan’s original drawings, plus photographs of rare and historic tarot cards from the British Museum (256 pages).